Lead the animal revolution with an army with flamethrowing Boars, mustard gas-lobbing Skunks, and a fighting force of World War One era beasts. With online matchmaking and split screen multiplayer, this perfect distilled Real Time Strategy game has something for everyone. 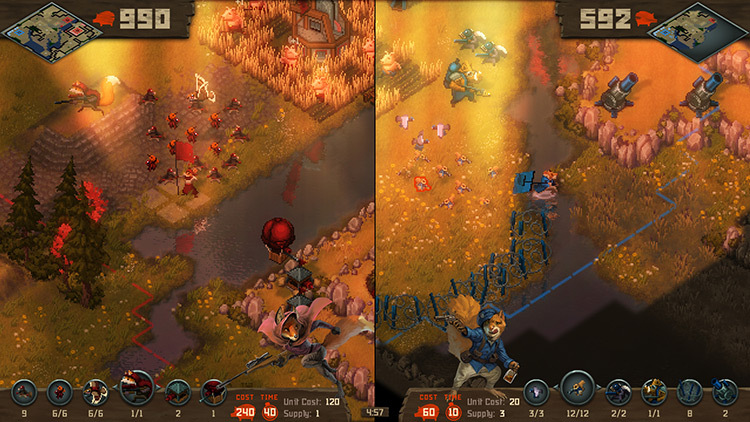 Tooth and Tail might be a little too simplistic at times, but there's still a lot of good gameplay to be had. Tooth and Tail rebuilds the RTS genre with an easily accessible console-friendly design that retains the elements that make RTSs so much fun. Fast-paced gameplay, random maps, and a dark, humorous tale told not just in the campaign, but in the design of each unit. This is a step in the right direction over other bite-sized RTS games. Rotating through the band of 20 fighters will offer plenty of depth on its own, too. There's plenty of room to fake out foes by overbuilding one type and feinting a foe into countering that so you can sweep them with your own reserves. If you don't have quite the squads you need to deal with enemies in the best way, you'll have to adapt -- and strong variety will give you the tools to come up with unique combinations and tactics on the fly. 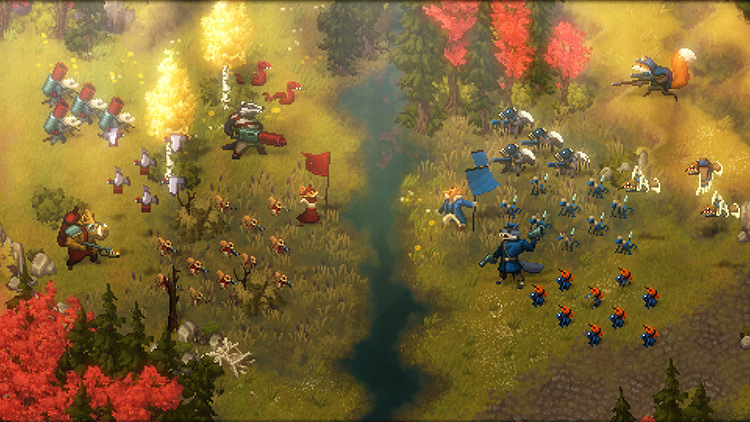 Those looking for a hot new strategy game should look no further than Tooth and Tail. 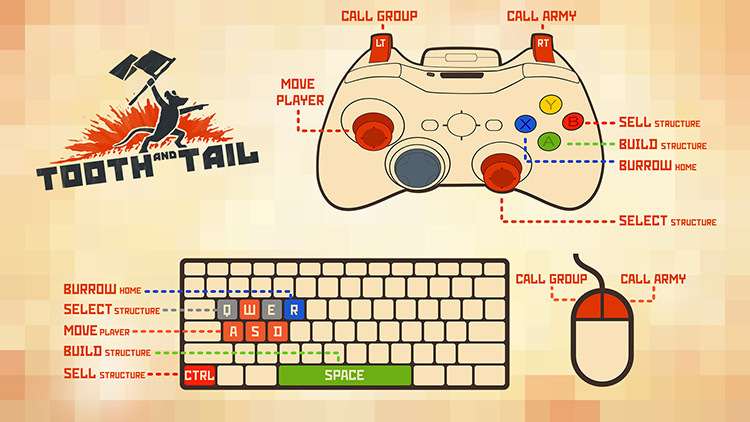 Providing endless amounts of fun with fair and fast-paced action, Tooth and Tail fights tooth and nail for its place in the RTS pantheon. It proves that innovating on an old school genre is sometimes the best thing needed. This doesn’t mean other games have to follow this design from here on out, but it shows that things can be done differently while being immensely enjoyable. 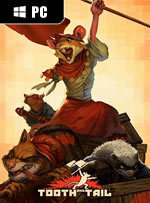 Those two semi-complaints aside, I definitely think that Tooth and Tail is worth a look. It has a compelling and well-crafted world coupled with beautiful pixel art graphics and a challenging and interesting campaign. It has a unique and fun multiplayer mode that has grown on me despite my quibbles. And more than anything, it shows the power of a studio determined to execute on their vision and the dedication to achieve a design laser-focused on providing a specific experience. Tooth and Tail is an elegantly simple RTS that’s perfect for newcomers or anyone wanting to play on the couch. It isn't without its flaws, but Tooth and Tail is still a competent RTS title that provides enough strategic depth for veterans, whilst also providing an approachable entry point for newcomers. Its backdrop of an animal civil war translates perfectly into the genre and each unit type was a joy to master and experience in battle. In the end Tooth and Tail is a must for anyone that has enjoyed playing through any of Nintendo’s Advance Wars titles. Even though it doesn’t feature turn-based combat and instead opts for quick and simple build and attack mechanics. Where the two titles find common ground though is in the fantastical and comic setting they both apply to rather grim circumstances. Tooth and Tail may be a game with cute squirrels and mini-gun wielding badgers, but underneath that lies a great story about fighting for freedom. Tooth and Tail no es un RTS nuevo cualquiera. Es algo serio que viene para contar algo nuevo. El hecho de que se juegue mejor con un mando es toda una declaración de intenciones. Carece del componente deportivo de otros clásicos del género, pero porque se centra inteligentemente en su sistema económico y el equilibrio de unidades para demostrar que el género todavía tenía espacio para innovar. Es, sin duda, una de las grandes sorpresas del año. 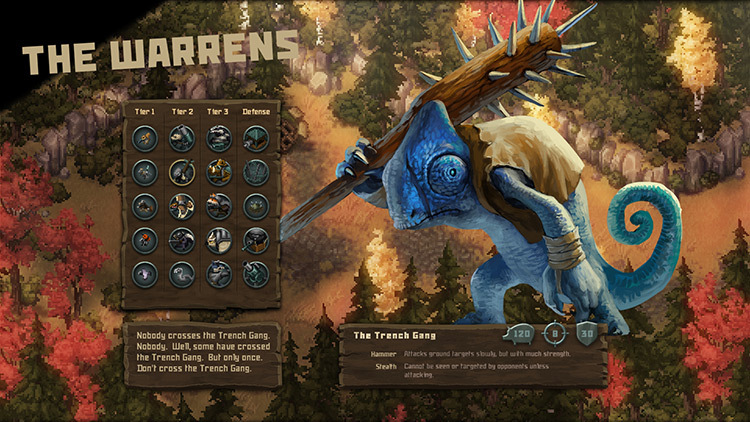 Dans un genre qui peine à se renouveler depuis l'apparition des MOBA, Tooth and Tail apporte un vent de fraîcheur bienvenue. Son gameplay rapide à prendre en main et adapté à la manette le rend accessible au plus grand nombre sans toutefois délaisser les habitués des STR, qui y trouveront là une expérience différente de ce qu'ils connaissent mais assez subtile et bien rodée pour satisfaire leurs envies de compétition, à moins d'être allergique au pixel art. Ovviamente quando nella vita e nel lavoro non ti limiti a rifare quello che hanno già fatto gli altri, rischi di incontrare più di qualche problema lungo la via. Per questo motivo sperimentare è sempre più complicato di affidarsi a degli standard. Tooth and Tail è un esperimento in buona parte riuscito, ma che richiede la revisione delle dosi, e la limatura di alcuni ingredienti.